Underdark commodities - Metals and minerals are obvious choices, including gold, iron, salts, stone, gemstones, oil and coal. Animal and insect-based products are plentiful. Fabrics include assorted leathers (e.g. chitin, giant snakeskin), woven material (e.g. cloth of gold, cloth of silver, mohair and spider-silk), furs (e.g. cave bear, displacer beast) and exotic hides. Parchment and vellum make scrolls and books with ink (e.g. cochineal, sepia) bound with metal plates or inlaid bone marquetry. Ivory (antler, horn) and related trades (scrimshaw) replace wood-craft (scabbards, hilts and smaller hafts) bearing equal decoration. Longer hafts are forged of metal, making such weapons more resilient, heavier and expensive. 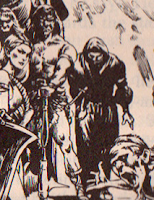 Arms and armour from the Underdark have history, from exquisite dwarven platemail to jagged orc battleaxe. Incense is made of amber, operculum and exotic reptilian musks, fluorescent and phosphorescent dyes are sold while psychoactive mushrooms and mould provides recreational drug sales. Surface delicacies - Goods from the surface that cannot be found below are valued. Foodstuffs, wood, wine and other sundries gain unexpected value. Spices, incense and salt all created trade routes and do so in dungeons. Honey and sugar in particular are popular choices. Wood may be treated with resins or pickled in vinegar to increase strength and kill mold. Weapons and armour are standard quality and plain but odd bits of craft slip down to the dungeon - arrows and crossbow bolts are particularly popular given the scarcity of wood and lack of adequate bone or ivory (shafts have to be footed or they're more likely to break). Charcoal is popular with traders - light, burns hot, useful for alchemy and rare since most wood is used for doors or structural support. Inexpensive, durable woven fabrics are at a premium. Plant-based incenses and resins are popular and command a pretty penny, narcotics are a potent trade item as is simple pipeweed. Logistics - Walking between the surface world and underworld needs a specific attitude and attributes. A willingness to deal with inhumanity makes the typical peddler world-weary, well-armed and familiar with magic. The use of wagons is limited to large passages and caves. Most routes however fit the description of 'twisty set of passages, all alike'. This means hand carts, bearers and the dungeon mule (or local equivalent). Climbing between levels, fording underground rivers and finding safe trading points make a dungeon peddler's lot interesting. Many underdark races are unpleasant, conducting trade negotiations in mutual strength with an eye for treachery. Negotiations with 'friendly' duergar may involve mutual paranoia, threats of enslavement and drinking sessions with mildly toxic spirits. Merchants who trade in megadungeons may not command wagon trains or armies of fat bodyguards. Rather they move between worlds, wielding fantastical wealth and a handful of elites. Find the right customers and you have a sweet life indeed. Dealing with some communities has risks - trading with aboleth is a fast route to indenture as a servitor. Yet the cautiously bold will take up trading within the megadungeon, forming a hub for communities to gather together. From these seeds, dungeon ports and sunken cities provide fertile breeding ground for these entrepreneurs.